A congested marketplace with highly flammable items is a hazard as was realised in Merkato on Friday. 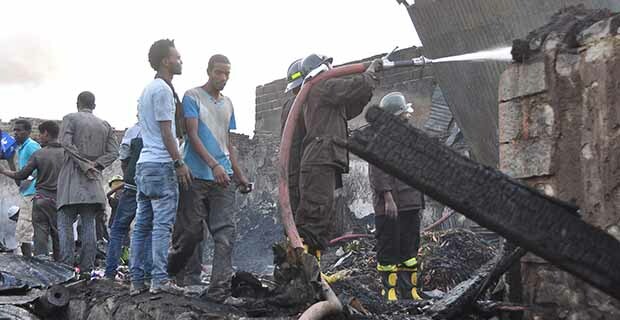 Fire broke out Friday in Merkato, the biggest open-air market in Africa, in an area commonly referred to as Shera Terra, Addis Ketema district, Wereda eight, leaving at least 21 people injured , with damages to property of close to 43.3 million Br. The fire started around 2:40 pm on June 5, 2015. “We received the call at 2:57,” said Solomon Mekonnen, communications head at the Addis Abeba Fire & Emergency Prevention & Rescue Agency (AAFEPRA), adding that the fire brigade was mobilised immediately. At the time the fire broke out, Mesfin Lema, a plastic shoe wholesaler at Merkato, was in the area. According to him, the fire fighters managed to reach the place early but they were not able to do much. Though the cause of the fire is yet unknown, talk among the bystanders and traders in the area was that the fire started at a cafeteria behind a number of congested shops. The shops in the area sell mostly plastic shoes and edible oil, which, coupled with the narrow paths in the area, made controlling the fire difficult, according to Solomon. As Fortune arrived at the scene, several members of police officer from Federal and Addis Abeba city administrations were present in large number. The Agency had allocated 12 fire trucks from all its seven branches with an additional one from the Ethiopian Airports Enterprise. The fire fighting effort used 227,000lt of water and 2,300lt of chemicals, deploying 116 workers in the process.